Saturday 8th August, 1981: Cradley stun Coventry with an astonishing 52-26 victory at Brandon, despite the TV commentators predicting pre-meeting that the Heathens reserves would be their achilles heel. Little could they have expected that David Shields would go through the meeting unbeaten in three rides with one of his best ever Cradley performances. It would be grossly unfair however to remember this talented and tidy rider for that sole performance - despite the fact that it was on a night that Dave Lanning quite rightly predicted would be talked about for years. The little Aussie actually had two separate spells with Cradley, as well as impressing the National League spectators in a season with Oxford. His Speedway career began around his local track Jerilderie Park, Newcastle in May 1974 but a badly broken thigh kept him out of the saddle for two and half years before he could settle into some serious action. His return to the track in December 1977 quickly made people sit up and notice and after impressing for New South Wales against a touring England side, he was signed by Dan McCormick for Cradley and loaned to sister track Oxford for the season. His first appearance came at Milton Keynes in a challenge match where he shattered the track record and chalked up a 12-point paid maximum. Then followed his National League debut a week later at Newcastle with nine paid eleven. By the end of the season, five maximums and 353 points later, he had clocked an 8.83 debut league average, while reaching more than 10.00 on his home track. He also made 15 appearances for the Heathens, twice hitting eight points, twice getting seven and only once failing to score (at Reading). In early 1979 he suffered a broken collarbone in a World Championship Qualifying round. He shocked Oxford by announcing that he wouldn't be returning for Britain, and the lay-off somehow lapsed into a semi-retirement. He didn't return to UK action for two years, until being tempted back to Dudley Wood by Peter Adams in 1981. He started the season in the difficult number two berth, and then dropped to reserve in May. 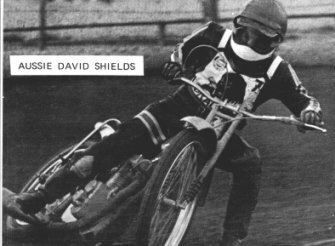 Quickly finding form he rattled in some impressive performances, and on the back of that famous Brandon massacre was Shields' best Cradley score - 12 points against Hull just one week later. He finished the season with 255 points from 58 matches (league, cup & challenge) but decided not to return in 1982 and sadly did not appear for the club again. In 1999 I heard that Dave made a shock racing comeback down under. It was reported in the Hunter Motorcycle Club NSW newsletter that not only did he return to the saddle but also scored 14 points and WON the club meeting at Nepean! Furthermore, who should be his main challenger in second but his son Ben! Dave was racing an old upright and opposition on the day was said to be pretty good including Ty Platt, Dave Booth and Lee Herne, all good performers on a regular basis at Gosford Speedway. There may be a little family legacy in the making here as not only is Ben a budding star of the future, but nephew Adam made his British debut in 2000, signing for the Isle of Wight in the Premier League and establishing himself as a regular heatleader. We look forward to seeing more of all three of them in the future!